Have some questions about all the fun you can have at Dorney Park? Well, you've come to the right place. Here's a list of some of the most common questions we hear from our guests. Take a look and see if you find what you're looking for. The best deals on tickets are available online through our website. You will save big off the regular front gate price when you buy your tickets in advance, plus have access to special combo offers available only online. 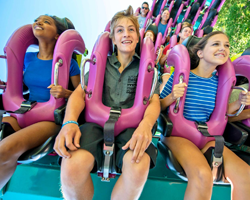 Your admission to Dorney Park includes all rides (see exceptions below), live shows and attractions, Wildwater Kingdom water park, and Planet Snoopy™- a theme park just for kids! During the Regular Summer Season, your ticket also provides full access to the wet and wild fun of Wildwater Kingdom. The Regular Summer Season typically starts on Memorial Day weekend and offers daily operation of both Parks through Labor Day. Please note that Dorney Park and Wildwater Kingdom have different season calendars and daily hours of operation. Dorney Park does not sell admission tickets exclusively for Wildwater Kingdom. When visiting before or after the Regular Summer Season you can save on your Dorney Park only ticket by purchasing online. 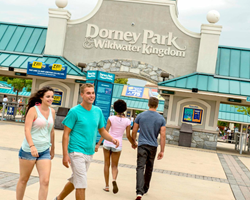 Dorney Park & Wildwater Kingdom's Walk-Up Gate Rate is constant all year. Purchase in advance online and save! Dorney Park does not offer a non-rider discount. Dorney Park has a one-price admission since it is a multifaceted park, not just a ride park. Live entertainment abounds at the park with fun-filled shows and roving characters and performers. The park also offers a variety of gift shops, restaurants, a water park and much more - all included with park admission! Admission tickets and Season Passes are non-refundable and non-exchangeable for any reason after the order transaction is complete at the Front Gate, online through our website, or other retail outlets. This includes weather related events. We do not issue rain checks. Please check local weather conditions prior to planning your visit. Unprocessed Season Passes (those still in e-ticket or voucher form which have not been exchanged for a ID card) may be transferred to another individual. All Season Passes, processed or unprocessed, expire without value on November 3, 2019 unless renewed for the next season. 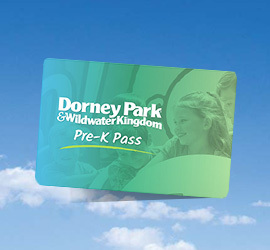 Dorney Park offers a Senior discount ticket for purchase at the Dorney Park Front Gate with a valid ID showing proof of age. Seniors are considered anyone age 62 or older. Guests age 2 or younger are FREE and do not require an admission ticket. Guests age 2 or younger are FREE and do not require an admission ticket. Guests age 3-5 yr olds are eligible for a Pre-K Pass (link to pre-k page). Any guest age 5 or older will require a Regular ticket. Are group rates available for Dorney Park? Yes! We offer a number of different group sale options, typically for groups of 20 or more people. What should I do if I have an issue printing my tickets online? No need to panic. Once you complete your online transaction, you will receive an email with your purchase receipt. If you are unable to print your tickets at your current location, you can open your email receipt and attempt to print them at a different location (for example, a public library or friend's house) without any problem. If you are still unable to print your tickets, we will be happy to print your tickets for you at Guest Services. You will need the credit card you used to purchase the tickets and your confirmation number. What forms of payment are accepted at the Park? VISA, MasterCard, Discover/Novus Card, American Express are accepted for the purchase of Admission Tickets and at most merchandise and food locations. Personal Checks are not accepted at any location in the park. For your convenience, ATM machines are located directly outside the Park Entrance, near Center Stage Foods, in Wildwater Kingdom near Subway, outside of Good Time Gifts near Main Plaza, and near Cluck's and Frank's Main Midway food location. 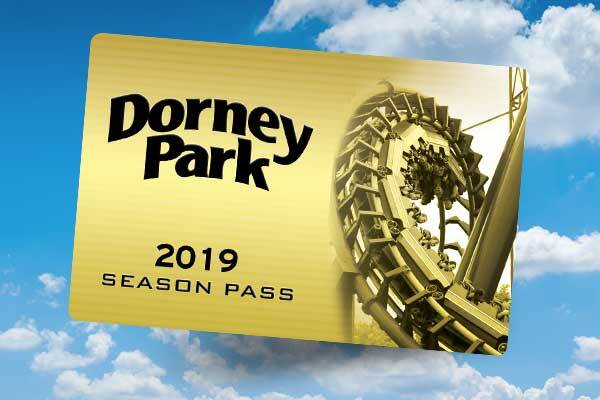 Dorney Park's Beagle Bucks are accepted toward the purchase of gate-rate admission tickets, parking, food, merchandise and games at Dorney Park & Wildwater Kingdom (arcade games and vending machines excluded). Beagle Bucks are also accepted at all other Cedar Fair Entertainment Company parks. Please check with each individual park regarding rules of acceptance. Beagle Bucks work just like cash and are available in $1.00 & $5.00 increments. Beagle Bucks may be purchased in advance by contacting Group Sales at 1-610-395-2000. You may also purchase Beagle Bucks in-person at the Park at the Group Sales Window or Guest Services Office at the Main Gate. Does Dorney Park have Automatic Tellers Machines (ATMs)? What is appropriate attire for visiting the Park? In Dorney Park, shirts, shoes and shorts are required upon entry and exit and at all times except when actively riding Thunder Canyon or White Water Landing. Bikini tops are acceptable, but bikini bottoms must be covered. Shorts/pants must be worn so as to show no more than the waistband of any undergarments. In Wildwater Kingdom, proper swimming attire is required and is defined as a properly fitting and covering, one or two-piece swimsuit or shorts that stop above the knee. Swimwear must be without abrasive buttons, rivets, zippers or snaps. Thong suits are prohibited. Diaper covers are required for all diapered children and are available at Trade Winds Gift Shop near the entrance to Wildwater Kingdom. Shoes are not allowed on any water park attractions. Haunt Attire: No costumes, halloween makeup or masks during Haunt. Dorney Park reserves the right to remove anyone from the park if they do not follow this Haunt specific guideline. Most rides and attractions remain open during rain. Some attractions will close when inclement weather prohibits their safe operation, but will reopen as soon as it is safe to do so. Please enjoy a show, meal or shopping until such weather passes. Admission tickets and Season Passes are non-refundable and non-exchangeable for any reason after the order transaction is complete at the Front Gate, online through our website, or other retail outlets. This includes weather related events. We do not issue rain checks. Please check local weather conditions prior to planning your visit. For everyone's safety, guests are not permitted to bring coolers or outside food or beverages into Dorney Park & Wildwater Kingdom with the exception of one factory sealed bottle of water per person. Exceptions are made for guests with special dietary needs to include food allergies and baby food/formula. Guest should contact Guest Services or Park Security upon arrival for approval to bring in these special dietary foods. Picnic tables are provided in select locations of the parking lot for outside food consumption. Grills and open fires are not allowed. Stop by Ride Services, located next to the main gate, to speak with an associate about your visit and receive our Guest Assistance Guide, which outlines the rules and requirements for guests with disabilities. For more information prior to your visit, please visit our Guests with Disabilities section. Smoking is not permitted anywhere on Dorney Park & Wildwater Kingdom property with the exception of several designated smoking areas, which can be located on our park map. Wheelchair rental is available at the Stroller/Wheelchair Rental Center at Good Time Gifts near the Main Entrance. A limited supply of motorized wheelchairs are also available for rent. A small portion of units are available for rent online. All others are available on a first-come, first-served basis in park on the day of your visit. Pricing can be viewed on the rentals page. Yes, locker rentals are provided in a variety of locations in Dorney Park. We offer both hourly and all day locker rentals. There is a limited supply of locker units available only on a first-come, first-served basis. Extra-Large items that can not fit in a locker may not be left unattended and cannot be checked or held by the Park. Please utilize the Main Gate's hand stamp re-entry to bring these items out to your vehicle for storage. Dorney Park & Wildwater Kingdom bears no responsibility nor liability for any of your items that are lost, stolen, or damaged. Be responsible. Can Dorney Park accommodate special dietary needs? Dorney Park recognizes the different dietary restrictions many of our guests have, and strive to accommodate all needs. See additional information on special dietary needs and the food within the Park. What is the policy on alcoholic beverages at Dorney Park? Guests must be at least 21 years of age to purchase, possess or consume alcoholic beverages at Dorney Park. A valid state-issued identification or driver's license is required for each person purchasing, possessing or consuming alcoholic beverages. Alcoholic beverages must be fully consumed or discarded on the premise where served. Alcoholic beverages are not permitted on the midways or while in line for any ride. How do I re-enter should I have to leave the park for some reason? Re-entry hand stamps are available at the exit turnstiles when leaving the Park. Hand stamp re-entry is not permitted after 6:00pm during our Haunt season. If leaving and re-entering the parking lot, display your parking ticket on your dashboard. What happens if I forget or lose my Pass? Your Season Pass ID card is required for park admission. If a Season Pass ID card is lost, stolen, or forgotten, a regular park admission ticket may be purchased or the ID card can be replaced for a $15 non-refundable replacement fee. A complimentary ticket is provided to each passholder for one visit per season without paying the replacement fee. Once this complementary ticket has been used, the pass holder will be required to pay the replacement fee on the next visit that they do not have their Season Pass ID card. Passes can be replaced at Guest Services. All drones (Unmanned Aerial Systems) are prohibited at (in) all Cedar Fair parks, including Dorney Park, and any unauthorized drone(s) observed over Dorney Park will be reported to the FAA and local law enforcement, regardless of its point of origin or operation. Drones may pose a potential safety risk and may violate Federal Aviation Administration guidelines. What security procedures are implemented at Dorney Park & Wildwater Kingdom? Dorney Park does not tolerate guests who fight and/or harass other guests while on our property. People who engage this behavior are subject to being ejected and potentially banned from the park, and may be subject to arrest by local police. Associates and Non-Associates are prohibited from soliciting or distributing any written, printed, consumable or electronic material of any kind for any purpose on the Company's premises at any time. An associate may not invite or encourage any non-associate to engage in conduct which would violate this rule.